Karen Doherty, VP of Exaclair, Inc., graciously sent me this Clairefontaine Large Tan Clothbound Basics Notebook for review. I personally really enjoy using this notebook, not only because of its great, compact size, but also because it has a lovely, elegant design. In essence, it is the epitome of practicality, as it contains beautiful, excellent quality 90g Clairefontaine paper, along with a functional, yet attractive, design. Let’s explore this wonderful notebook, shall we? For all you journal lovers out there, you’ll be pleased to discover that this notebook can, in fact, lay perfectly flat on virtually any surface! It’s cover has a smooth, satin finish, and is of a tan, hardboard material. I find the delicately subtle creases on the hardboard cover to be actually very nice and somewhat reminiscent of leather. As indicated by the name of the notebook, this journal is clothbounded, a wonderful trademark of Clairefontaine. The book is made in France, and contains 96 sheets, or stated otherwise, 192 pages. Unfortunately, the first page of this notebook, as it is with most others, is glued/attached to the cover page. And of course, this first page is wasted, which to some degree bothers me. Intricate, yet subtle, embossing of the Clairefontaine logo located on the front cover. In addition, the paper quality of this Clairefontaine is great. Clairefontaine paper is suggested to be the best paper in the entire world for writing – and I am almost entirely convinced that this is true. I managed to do a writing test with various inks, and I have to say, there is very limited feathering and virtually no bleed through. Thus, rest assured, your precious fountain pens and their inks will definitely eat up this paper just as my pen did. However, I do have a caveat. For those of you who dislike the off-white, or extremely bright white, color of Clairefontaine’s notebooks, this notebook does have incredibly white paper. In addition, one of the things that I do not like about the notebook is the lining. I find it to be really bold, and a very unattractive shade of blue. These are just some minor things that I would like to point out. As always, this Clairefontaine paper is fountain pen friendly, as indicated by my new Lamy Safari Blue Medium Nib. Oops, it seems I made a little smudge a few lines back, but that’s ok! I like the bright white paper, my personal preference, but the lines look a tad bit awkward when matched up against this pen. There is absolutely no bleed through and/or feathering on this premium 90g Clairefontaine paper. Shall we experiment with a few more colors and pens? Overall, this is a relatively solid notebook. I love its simplicity and elegance, while still maintaining a sense of austerity. The colors are very soothing, and the wonderful covers and smooth paper make writing in this journal a pleasing experience. If you like this notebook, you can purchase it at http://www.thedailyplanner.com, or any other fine stationery online store, for a low price of $8. • Binding is sewn with linen thread. The 2009 US Open is off to a great start. I find this year’s US Open to be exceptionally spectacular, both on and off the court. For instance, I absolutely LOVE the new feature of including a US Open LIVE feature, where fans at home can watch free, full length matches in high definition complete with commentary. It’s really broadened the availability of tennis in America, strategically increasing popularity through this process. I’ve always been a fan and found it annoying when I didn’t have the TV station that was hosting the Open that day or when the commentators would continuously switch through various courts, never staying on a single match for the whole time. But what I love most about this year’s US Open is women’s tennis. Of course, men’s tennis is always a pleasure to watch, but it’s been mind-numbingly dull to watch this year. Sure, you might enjoy watching Federer destroy Lleyton Hewitt in a barely entertaining 4-set match, but I’d rather watch a fabulous upset on the women’s side. Speaking of upsets… there’s been plenty. Take Melanie Oudin, age 17, from Marietta, Georgia. This summer, she upset No. 6 Jelena Jankovic at Wimbledon, going all the way to the fourth round. She brought that intensity and a raised level of confidence to the US Open. So far, she’s continuing into in the fourth round, having accomplished two MAJOR upsets (in my opinion, they were even more well-earned than Jelena Jankovic’s defeat). Miss Oudin managed to defeat the 2008 Beijing Olympics Tennis gold medalist and ranked No. 4 Elena Dementieva 5-7, 6-4, 6-3 and even No. 29 and three-time grand slam winning Maria Sharapova 3-6, 6-4, 7-5. Her next match up will be against No. 13 Nadia Petrova. In addition to having these two goliaths out of the tournament so early, No. 5 Jelena Jankovic and No. 1 Dinara Safina fell in two long, hard fought matches. Jelena Jankovic lost in the second round to No. 55 Yaroslava Shvedova 6-3, 6-7(4), 7-6(6) saving two match points! And tonight, No. 1 Dinara Safina fell to Petra Kvitova, 6-4, 2-6, 7-6(5) in an agonizing and intense match. On the men’s side, James Blake also fell to Tommy Robredo. It’s always been somewhat natural for most humans to cheer on the underdog. I’ve always loved Sharapova, but when I see her up at the court against Georgia’s own Melanie Oudin, I immediately have an intense disliking for the Russian. It’s always fascinating how humans always love to see upsets, no matter how emotionally debilitating they may be to the high ranked player. I reckon that Dinara Safina, criticized for never having won a grand slam title as a No. 1 ranked player, may go downhill from here. After such a loss (she had four match points), terrible playing in the past week, and continuous criticism from fellow players, fans, and experts… I don’t expect her to bounce back anytime soon. And while you and I may have had our chuckle, our satisfaction of knowing there’s still hope for people who aren’t Number One, most of us fail to see the damage that these seemingly fun and harmless upsets can cause. Sooner or later, we’re going to be cheering for the young teenager who’s on Arthur Ashe, against Melanie Oudin, a top ten player. In the world of ups and downs, everyone has to take his or her own toll. Stay Tuned for Upcoming Reviews! I’ve recently returned from a trip, and I have a great many notebooks and fountain pens that are just dying to be reviewed. Over the next couple of weeks, you’ll definitely see a lot of posts coming… so stay tuned! I just bought these teeny tiny Moleskine Volant notebooks (both black ones) at a Barnes & Noble. 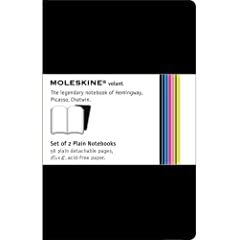 It’s the Black Moleskine Volant Ruled Pages 2.5″ x 4″ – Set of 2. Initially, I didn’t really stop to think what I would do with them, but later on I realized that they could be rather useful. 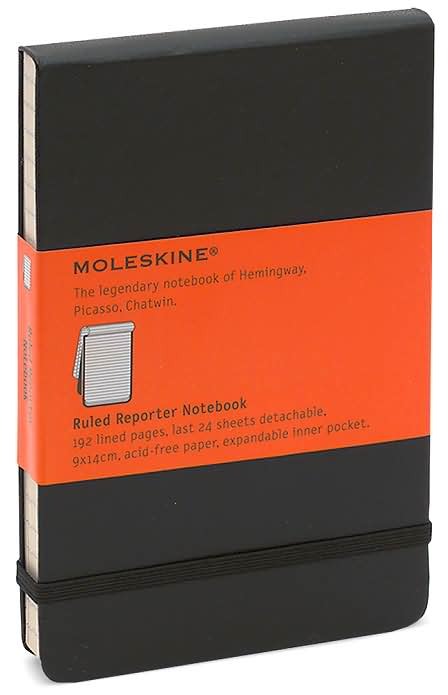 Normally, I only buy Moleskines when there is isn’t an Exaclair product substitute (such as the Moleskine Ruled Reporter Notebook or the Large Sketchbook). I found this little specimen to be a rather interesting addition to my collection of notebooks and journals. When I first used the notebook, it was hard to operate; it wouldn’t lay flat and the first page was awkwardly creased. On top of all the nuisances, the pages and cover smelled odd; there was some weird chemical odor that I couldn’t pinpoint that wafted off every single page. Nonetheless, it was still a pleasure to write on despite the fact that it was hard to keep open. I don’t think I’ll use this too often, but the ‘fine’ stationary, neat size, and handy detachable papers (which is essentially the only reason I bought this) may be important to me in the future. Yet, in reference to the detachable pages, there is something called a Post-It Note. The fact of the matter is that although I am the type of person who spontaneously comes up with ideas on the go, I tend to write them in my reporter notebook or my journal rather than in a cute and chic Moleskine Volant. Nevertheless, this is a truly interesting item and you would be ‘asinine’ (I’ve come to really enjoy this word) to not bother to try it. Before I begin with my review for the Habana Notebook, I would like to thank Karen Doherty, Vice President of Marketing for Exaclair Inc., for graciously sending me this amazing journal to review. Exaclair’s website is found at http://exaclair.com/ and the company is the US distributor of Clairefontaine, Exacompta, Rhodia, Quo Vadis, G. Lalo, Brause, J. Herbin, Mignon, and Decopatch products. Lined paper, with roughly an inch of free space on the top of each and every page. 80 sheets of 90g Premium Clairefontaine Paper. Acid free and pH neutral. Notebook comes in two sizes: Pocket and Large. Dimensions are, respectively, 4″ x 6 3/8″ and 6 1/4″ x 9 1/4″. The Habana notebook features a rather elegant “leatherette” material cover, which in my opinion feels like rubbery, soft feeling leather. I personally really like the cover, as it’s really smooth, yet very sturdy. However, depending on how much you use the Habana, it might become compressed and possibly disfigured if in contact with heavy objects. For instance, the rubber band closure has already created a small indent on the cover. On the front, you’ll also see rounded corners which can come in handy, to avoid getting uncomfortably poked in the stomach, when writing with your notebook on a comfy sofa chair. On the bottom of the front cover, the signature Quo Vadis monogram is subtly located on the bottom right-hand corner. I like the smoothness of the design, and how it doesn’t necessarily have to jump right at you to catch your attention. On the back cover, the words Quo Vadis, along with the monogram, are again etched in very subtly in an attractive fashion. Overall, I find the cover to be rather enjoyable and attractive on this Habana notebook. The Habana notebook also comes with premium 90g Clairefontaine Paper, which is a definite plus. However, many people seem to dislike the shade of white the paper comes in; others prefer ivory, when this paper is simply bright white. For all pen users alike, I can see why a paper’s color would be an offset, but for me, any shade of white will do. If you don’t mind the fact that a Moleskine notebook’s paper may be slightly more yellow than the Habana’s, or that other Clairefontaine and Rhodia notebooks come with ivory colored paper, then I don’t see why there would be a problem with the Habana. And besides, this is great Clairefontaine paper we’re talking about, so it’s high quality stationary nonetheless. For the feathering and bleeding test, I decided to use pens that one would find in an office or school setting. I believe that for the most part, people don’t tend to use fountain pens in school and at work as often as they would use the pens that I have included. Nonetheless, I could most definitely be wrong, so I decided to include a pseudo-fountain pen, the Pilot Petit 1. I’m sorry if you are disappointed with my lack of fountain pens, but I tend to use roller balls more frequently anyways. From the list of pens written on the sample page, I hoped that you were able to see that I tried to incorporate various types of writing utensils. I used a fountain pen, Sharpies, Gelly Roll pens, normal BIC pens, rolling ball pens, fineliners, pencils, highlighters, marker, color pencil, and more. As you can see, despite the controversial shade of white, the paper beautifully represents each and every color, as well as most writing utensils. Each and every utensil was extremely easy to write with, and there was simply no skidding or stopping when writing on the paper. The only exception was the Gelly Roll pen, but only because the ink was drying up after having not been used for a year or so. In addition, there was virtually no feathering or bleed through. The only sign of bleed through was with the two Sharpies, which is of course expected. Even with the Sharpie markers, the paper was able to withstand the ink and only show somewhat minimal bleed through. The 8mm lined ruling is also somewhat wider than I am used to, however it is not a very big concern. Nonetheless, Clairefontaine paper is topnotch stuff. There are also many other delightful surprises that come with this fantastic notebook. As mentioned before, on the back cover there is an inside pocket that is expandable for storage. I really don’t tend to use the back folders, but they are very helpful for holding things, such as sticky notes, index cards, photos, and many other things. And on cue with a scholastic review, it is absolutely PERFECT for any class that is in high demand for index cards, such as English or Spanish. I was also able to take a snapshot of the binding of the Habana, in case any of you were interested in seeing it. The binding also allows the notebook to lie entirely flat, which is not only a plus for students who take notes on desks, but also for the everyday writer and journalist. Summer… It’s Time For Tennis! Everyone who knows tennis knows that it’s best in the summer. Sure, playing with your friends and coaches in a plush, indoor tennis court is a fair simulation of the sport, but the true tennis player knows that outside is where it’s hot – literally. In the summer, you can still play indoors, but the atypical smoldering heat with low-powered fans becomes excruciatingly unbearable. Just go outside. I remember playing tennis in the spring for my school team feeling as if I had shed away the cocoon of a slow and cold winter. I definitely was not adjusted or used to the dimensions and ‘feel’ of the court… us tennis players know what happens when you stay indoors too long. When I got ready to serve, and then felt a gust of wind, I knew that this is what I had been missing in my tennis games. The aspect of nature. The past week that I had spent playing tennis was almost brutal. Having returned from a three week hiatus of nothing but adorning suits and ties, I was what you would say ‘rusty.’ Nonetheless, I have recovered from said embarrassing incident and hopefully the next time, it will be more bearable. I played with a Babolat Pure Drive Cortex Standard Racquet ($175) with Babolat Hurricane Pro Tour Gauge 16 strings, at an initial tension of 65lbs… which most likely fell to a 60 or 61lbs by now. In addition, the handle is size 4 1/2 and the overgrip I use is Prince Microtac. I’ve tried the Wilson Pro Overgrip and the TournaGrip, but for some reason I switched over to using the Prince just a week or so ago. In addition, I used the Babolat Custom Damp (Blue & Red) and frankly, they’re the best shock absorbers I’ve used to date (they definitely beat out those silly Djokovic frowny face ones). Although I have two of these racquets (identical in everything except for the color of the shock absorber and overgrip), I decided to “demo” two other racquets: the Babolat Aero Storm Racquet 2008 ($185) and the Head MicroGEL Extreme Racquet 2009 ($180). With both of these racquets, I felt as if my volley and net game were significantly improved in comparison to with my Pure Drive. Yet, I felt as if the Aero Storm racquet was a little clunky, as the head of the racquet has more weight than the head of the Pure Drive. I think my Pure Drive allowed me to play more consistently and with more spin than both the Aero Storm and the Head MicroGEL Extreme, but all three were great. And today was a doubles day, so the other two racquets came in handy. The loud and crisp “pop” of the tennis ball and the squeaking of the tennis shoes are ever so reminiscent of the tennis season. With Wimbledon and the French Open already past, fans have yet to witness the US Open 2009. When fall comes around, the leaves blow around as the temperature begins to drop. Yet tennis still continues on, all year round, whether it be indoors, outdoors, or both. Summer will surely be one to remember, regardless of whether or not you share adoration for the sport of tennis, so be sure to take notes especially on this one. For some odd reason, the time of the year when I am most academically stimulated is right after my finals. For example, I scavenged double copies (saves my back!) of my Spanish textbooks, Precalc textbooks, and already purchased my American History and Chemistry textbook for next year. I know, it sounds like a lot of fun. But in all reality, whenever I buy new school supplies or textbooks, I always feel so eager to just jump in, be extremely neat and organized, and just study and work away the nights… but it never ends up that way. One of the planners that I bought for next year was the red Quo Vadis Equology Textagenda. I found this to be rather interesting, having owned a previous Quo Vadis Scholar Planner. Apparently, the entire Textagenda is ecologically friendly, with all parts of the planner being recycled, not just the paper. The Textagenda is comprised of 85% recycled material while still maintaining 90 g alkaline/neutral paper. The paper is actually very high quality, compared to other recycled ones, but it’s not as smooth or white as other Quo Vadis or Clairefontaine stationary. Nonethless, this is expected with recycled stock. I also recently plopped down $11 on a teal and orange Clairefontaine Clothbound Notebook. I really like how it’s not stapled, which pretty much minimalizes the creasing. However, the first and last page that are attached to the cover and back pages are always a pet peeve of mine; you pretty much can’t use the first or last pages. Clairefontaine is not only famous for its luxuriously smooth and white paper, made from environmentally controlled forests, but also its renowned cloth binding, which matches the cover. I bought my book Ruled, as I plan to take notes with it in one of my classes, of which will be special just because of this notebook. There are 5 sizes, I bought large, and there are 96 sheets (well really only 94). And finally, before I bid adieu to you on this very first post of mine (yay! ), I bought one last thing online. A Moleskine Reporter 3.5 x 5.5 Ruled. I know. The dreaded, but famed, Moleskines have somehow managed to persuade me enough to buying one of them. Alas, it was ONLY because… 1. B&N has an online deal of paying $10 for free shipping… 2. I received a Gift Card as an award (will elaborate later)… and 3. Because I somewhat feel as if I need to repay my lovely school newspaper back with a gift to my profession. So, this year, after toiling away at my lowly job as a freshman worker on the school newspaper, I managed to send out more than just a few articles, especially front cover articles. In the end of the year, I was given an award, a gift card to B&N, and was promoted to a head position on the editorial staff! Snag! So, I feel as if I should repay my kind fellow staff members by working even HARDER next year, and possibly even presenting a more ‘official’ role with more ‘luster.’ So I wanted to buy a reporter notebook, instead of writing on backs of wasted print offs. Originally I really wanted to purchase the Live Inspired Reporter “Why Not’ Notebook, since it was only $8, had great paper quality, and even had an interesting quote, neat tidbit, on the botom of each page. Neat. Real neat. Too bad it’s kind of under the covers and not really that promoted, so not only can I not find it in many big name stores, let alone small shops, but their shipping kind of outvalues the Moleskine… oh well! Well, I’m off to living my life some more. Expect to see me soon, and remember, take notes on this!